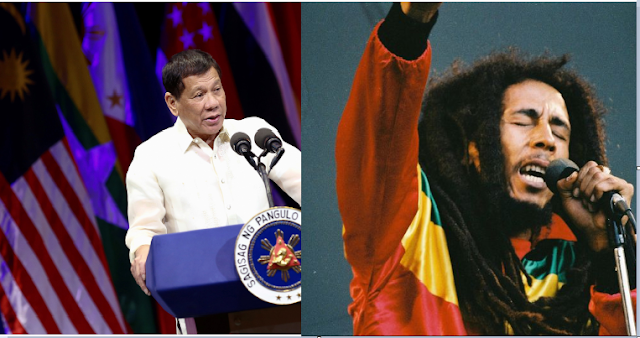 In his recent article, Director of Eurasia Future and a geo-political expert Adam Garrie compared President Rodrigo Duterte to Jamaican singer-songwriter Bob Marley, who became an international music icon for his spiritually infused music. Bob Marley, is the man who made reggae music popular – which was also incredibly anti-imperialist and deeply religious. Though Marley is a religious man, he was never into organized religion. He even resented most traditional religions by using his songs. “For Africa and the Caribbean, Marley’s music was itself one part political education and one part religious sermon. For others including white westerners, Marley’s music was an eye opener where familiar pop music themes of trite hedonism were replaced by deeply political messages slamming the colonial mentality while frequent words of praise to God were sung – something that rarely happened (or happens) in American or European popular music.” Garrie stated. “The first verse is an unambiguous rejection of the doctrine of earthly suffering for a heavenly reward that is preached by many established organised Christian churches. Instead, Marley insists that the downtrodden embrace a message of early empowerment combined with religious devotion to God whose omnipresence is out outside of and which transcends religious institutions.” Garrie explained. “The second verse continues these themes of earthly joy and redemption while the third verse criticises how organised religion is able to fool people into rejecting divine redemption on earth. While this section also makes reference to Marley’s belief in the divinity of Ethiopian Emperor Haile Selassie, the words even in this section continue to have a universal meaning for those outside of the Rastafarian movement.” He added. This message from Marley actually got the people thinking, but it also challenged the old religious groups and leaders, not only in Jamaica but also in Africa. Garrie has compared it to recent remarks of President Duterte, who spoke publicly about his dislike and distrust of the Catholic Church. During his time, Marley used concerns and records as a way to spread a message to empower oneself as it can lead to collective enlightenment, like how the Philippine President rejected the belief of the Catholic Church. “In this sense, Duterte is fast becoming like an elected version of Bob Marley for The Philippines – a man who without fear or restraint is preaching the truth as he sees it for the benefit of his people.” Garrie said. “When Duterte said “I do not care if I burn in hell, for as long as the people I serve live in paradise”, this was as powerful as any of the lyrics in a Bob Marley piece and were indeed very much related both in essence and spirit.” He said. “Like Marley, Duterte is now an icon of a political and spiritual movement that seeks both political and spiritual liberation from the colonial doldrums by embracing a God of humanity and of compassion rather than the one preached by institutions who themselves are as corrupt as any broken political system.” Garrie added.